When I was in college, my dad always asked me about my grades. Without fail. The question was sometimes oddly formal, and so frequent, that I got him a t-shirt from the bookstore that said, "Dad says, 'Buckle down and study hard.'" Now that I'm no longer taking exams and writing papers, he can't ask me that. But, he's found a new question. "How's the car doing?" I'm pretty sure he's convinced I'll kill it. Whenever I go home, I usually make a mad dash for the bathroom (after spending the better part of a day in the car.) While I'm in the house, Dad is outside walking around the car looking for the latest dent or scrape. I'll own up to driving over the odd curb or rubbing against a mailbox post, but that's usually it. Dad, I cleaned the car this week. It's no longer functioning as a third closet. 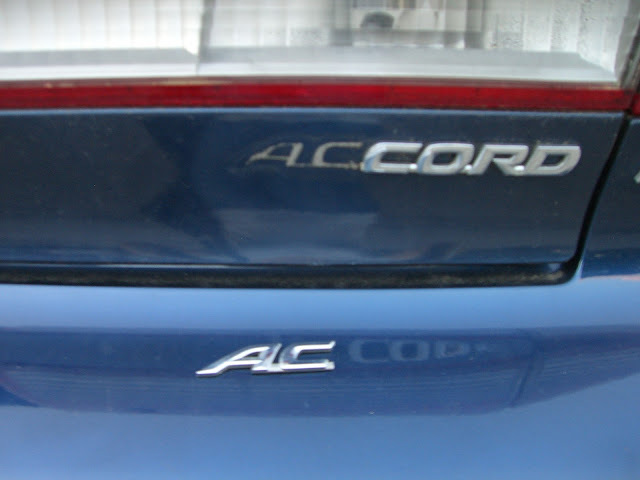 And, I found the A and C that used to be part of the ACCORD on the back of the trunk. A long time ago, I accidentally broke them off, and I was convinced they were lost in some parking lot. Another strike against me in car maintenence and care. I got some super glue, and now I no longer drive a CORD LX. 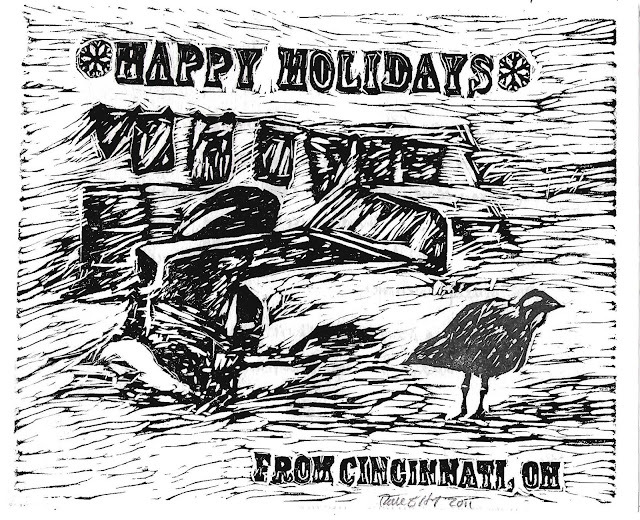 I also found this lovely little woodcut I received as a Christmas card. I'd been looking for it earlier this week, but couldn't find it anywhere in my apartment. Clearly. BECAUSE IT WAS IN MY CAR. My friend Rachel carved it. She's a talented printmaker and adventurous cook. She's got a great blog that chronicles the art making with a side of recipes. Check it out here. It was a pretty good evening. I have an empty car, a completely named car, and my missing print!